A Food and Farm Lab is part of the Great Park's first phase of development. Instead of a soil test, it might be cheaper to just add a little fertilizer and compost to the soil to help improve plant performance. Writer Eve Kelley of the San Diego Reader contacted UC Cooperative Extension horticulture advisor Vincent Lazaneo when she was bent on a conducting a soil text to diagnose her garden failure. “When someone tells me they want to have their soil tested, I first ask, ‘Why?’” Lazaneo said. The UC advisor suggested some alternate approaches for getting a garden to grow, gave reasons gardeners would resort to a soil test and explained how to collect samples. 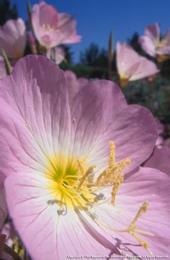 Mexican evening primrose is pretty, but can become an invasive weed. The Sacramento Bee recently warned readers of certain plants that might at first appear to be lovely, delicate greenery, but in time can become the vegetative equivalent of a street gang viciously expanding its turf. The story was picked up yesterday by Scripps News Service. The most notorious garden thugs, the story said, are bamboo and mint. Small farms and gardens to spring up in Sonoma County. The Sonoma County Board of Supervisors voted yesterday to open county land — including parts of parks, open space parcels and vacant lots in residential areas — to community gardeners and small commercial farmers, according to the Santa Rosa Press Democrat. The initiative is designed to make land available for agricultural production in an area where high land values make it nearly impossible to farm. An herb garden in the Farm & Food Lab in Orange County. At the end of a lengthy list of hoity-toity restaurants and upscale events published in the Los Angeles Daily News this week, the writer slipped in a road trip to the Great Park Farm and Food Lab in Orange County, where educational gardens are maintained by UC Cooperative Extension Master Gardeners.